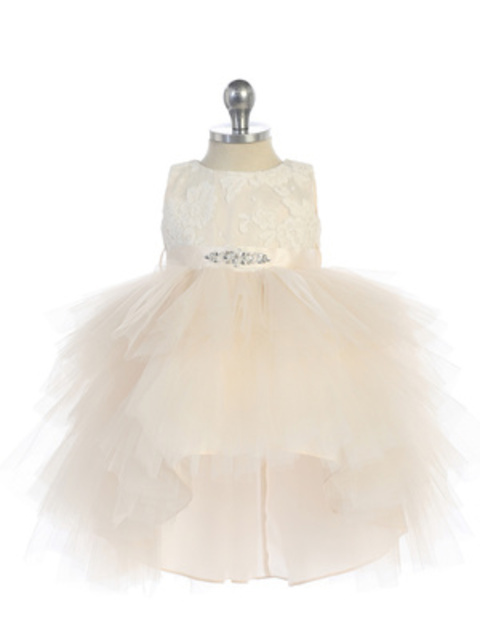 Gorgeous infant's dress features a lace bodice accented with satin belt. Belt accented with beaded applique at center and ties into bow in back. Multi layer tulle skirt with a high low design. Shorter skirt in front and longer train in back. Matching girls sizes 2-12 also available. This style is a special order. Please allow 2-3 weeks for delivery from order date. Phone in for possible quicker delivery options.